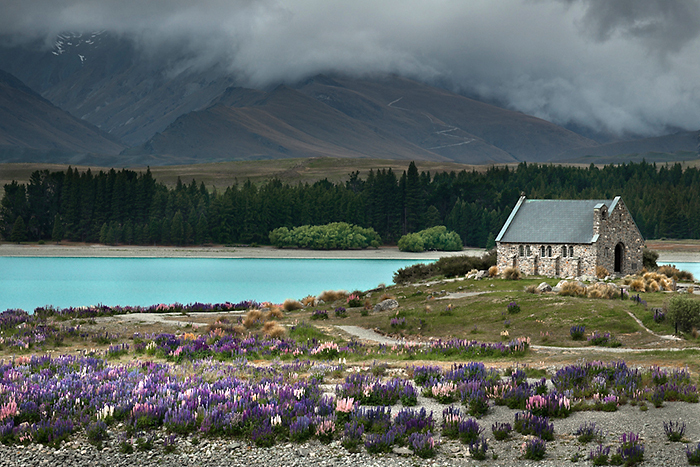 On my way… and with the Connie Lupin (see previous post) in full bloom around the “Church of the Good Shepherd” Lake Tekapo, New Zealand a dramatic view is created with an approaching storm in the background. The church was built in 1935 after a request from locals to the Anglican Vestry Reverend W.E.D Davies. The foundation stone was laid by the Duke of Gloucester in the same year and since then the location has been the idyllic setting for hundreds of weddings. The late afternoon foreground light against the dark background created a natural contrast. Along with the glacial silt blue of the lake and the vibrant mauve of the lupins, all the elements combine to give a dramatic feel to the image. These are the types of images I enjoy making. I like to have tension between the light and dark within the image, especially where the dark is dominant over the light. Light is so strong, an image only needs a small amount for it to command attention. Dark has to work harder and so I like to give it more space.